The transformation of a dragged-in interstellar magnetic field into a (fossil or dynamo-generated) stellar field, and the associated magnetic flux problem, is a fundamental process in astrophysics. Recent progress in MHD simulations of core collapse reveal a revitalized role for magnetic braking in the late collapse stages. Magnetic fields are crucial in determining the angular momentum content (or even the existence) of circumstellar disks as well as in outflow generation and star-disk interactions. The magnetic flux problem, and its resolution by non-ideal MHD processes, is then intimately related to the angular momentum problem and the origin of stellar masses. In addition, recent spectropolarimetric studies of magnetic fields in Herbig AeBe stars reveal that a re-examination of the standard magnetospheric accretion paradigm may be in order. High-resolution polarimetry is also revealing the magnetic field morphology with net poloidal flux and an hourglass shape within the inner collapse zone. 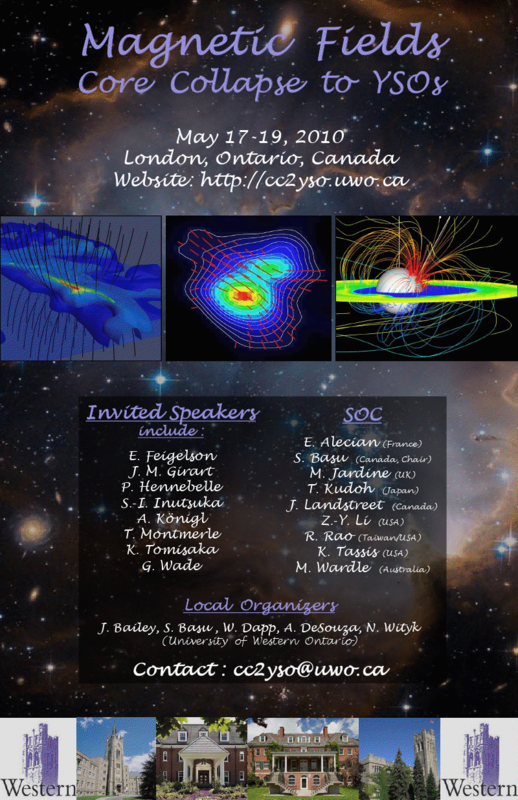 This conference will emphasize the emerging results in magnetic field simulations, observations, and theory as it applies to the late phase of collapse and early YSO evolution.